See all topic publications? Go to Current Research? Run PubMed Search Update? Limit to Full Text PubMedCentral? [new] Screening for distress and depression in cancer settings: 10 lessons from 40 years of primary-care research. Mitchell AJ, Vahabzadeh A, Magruder K.
[new] Screening for cancer-related distress: Summary of evidence from tools to programmes. [new] Identification of patient-reported distress by clinical nurse specialists in routine oncology practice: a multicentre UK study. Mitchell AJ, Hussain N, Grainger L, Symonds P.
J Natl Compr Canc Netw. 2010 Apr;8(4):487-94. Baker-Glenn E, Park B, Granger, L, Symonds P, Mitchell AJ. Mitchell AJ, Meader N, Symonds P.
Can the Distress Thermometer be improved by additional mood domains? Part I. Initial validation of the Emotion Thermometers tool. Can the Distress Thermometer be improved by additional mood domains? Part II. What is the optimal combination of Emotion Thermometers? Br J Cancer. 2008 Jun 17;98(12):1934-43. Epub 2008 May 27. Acceptability of common screening methods used to detect distress and related mood disorders-preferences of cancer specialists and non-specialists. Mitchell AJ, Kaar S, Coggan C, Herdman J. Screening for perceived need for help using the latest screening tools - what do we know about who wants help? Screening using the emotion thermometers: A useful extension to the distress thermometer when identifying major and minor depression? Is a single "Help question" effective in detecting anxiety or depression in early cancer? Author(s): Baker-Glenn, EA; Chaudhuri, A; Thiagarajan, S, et al. Author(s): Mitchell, AJ; Baker-Glenn, E; Thiagarajan, S, et al. J Clin Oncol. 2007 Oct 10;25(29):4670-81. Epub 2007 Sep 10. Reluctance to disclose difficult diagnoses: a narrative review comparing communication by psychiatrists and oncologists. Support Care Cancer. 2007 Jul;15(7):819-28. 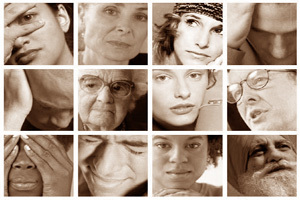 Evidence based screening for mood disorders - Is the distress thermometer sufficient? Coyne, JC; Low, J; Man, K, et al. Cox, K; Sharp, DM; Mitchell, AJ, et al.